Akane’s magic has always been the most powerful around she’s never even had to practice her spells. Finally her power has attracted the wrong kind of attention, and it looks like the mysterious Bell plans to capture her for study! 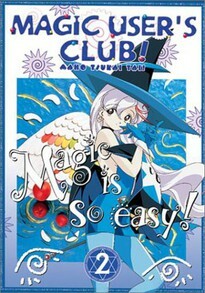 Later, the Magic Club takes a vacation to the beach, but is followed by Miyama and her evil comic book club. The hapless Magic Club president, Takakura, faces off against Miyama who can only be described as his archenemy. Unfortunately Miyama has one weapon Takakura can never defend himself against, a tremendous bouncing chest. With these two obstacles in his path he may never be able to overcome the threat she poses to the Magic Club. DVD Features: Art Gallery, Outtakes, Creditless opening, scene access, interactive menus.